objectiveFIELD, a visual-field testing device that requires no manual patient push-button responses, has been acquired by Konan Medical USA. A ground-breaking, objective perimeter that is easy-to-use, easy-to-administer, and an engaging experience for the patient. objectiveFIELD is a novel, FDA-cleared device designed to assess the human visual field in a completely objective and non-contact manner. Unlike the conventional method currently in use in most eye doctors’ offices, there is no need for any manual input from the patient. 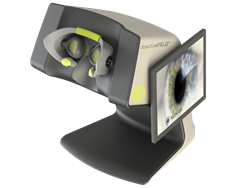 Using a patented multi-focal pupil objective perimetry method (mfPOP), objectiveFIELD tests both eyes simultaneously in only a few minutes. objectiveFIELD has been clinically researched in Australia over more than a 12-year period with more than 16,000 examinations across normal, glaucoma, macular degeneration, diabetic retinopathy, multiple sclerosis, epilepsy, migraine, concussion, and other neuro-vision conditions.1 objectiveFIELD was acquired from the Australian National University (ANU), includes novel features licensed from Seeing Machines™, and is the brain-child of noted researcher Ted Maddess, PhD, with his team “The Maddess Group – Diagnostics for Eye Diseases”, at the John Curtin School of Medical Research. Intellectual property acquired by Konan includes 15 issued patents in 9 countries, 6 patents in process, and clinical data to support a wide range of important diagnostic indications. The worldwide premiere of objectiveFIELD will be at the American Academy of Ophthalmology Annual Meeting in Chicago from October 26-30, 2018 at Konan Medical Booth # 2515 and it will also be showcased at the American Academy of Optometry in San Antonio, TX, November 7-9, 2018.
objectiveFIELD has also been clinically researched for use in concussion assessment at ANU that are thought to have visual-field manifestations. Recently Gordon Waddington, Professor of Sports Medicine at the Australian Institute of Sport, and Professor Braden McGrath, at the University of Canberra, additionally have helped conduct novel measures of visual function related to concussion injuries with objectiveFIELD technology. According to Marketscope’s 2018 Ophthalmic Diagnostic Equipment Report, it is expected that there will be about 149,008 perimeters in service in the global market in 2018, including 11,021 new perimeters sold annually, growing more than 2% per year, and representing more than $260,000,000 in global annual sales. Headquartered in Irvine, California, Konan Medical USA Inc. is an ISO 13485 MDSAP-certified company that develops, sells, and services specialized diagnostic products for eye care clinicians, eye banks and other neuro-vision related specialties. The company also provides diagnostic equipment and support services to many of the leading ophthalmic manufacturers in support of sponsored clinical trials research globally. 1 objectiveFIELD is not cleared for specific diagnosis of these conditions.